PREMATURE flower and fruit drop is a nightmare for any gardener. You can check the problem to some extent, provided you understand it. Fruit drop is very common in the citrus family. Any gardener who has any plant of the citrus species, like lemon, kinnow, sweet orange or mitha etc, must have confronted this problem. The joy of seeing the plant laden with flowers and fruit in the initial stage is short-lived when it is followed by fruit drop. The sight of a large number of half-developed fallen fruit is painful. The fruit drop in such plants can be attributed to many causes, both physical and pathological. Sudden changes in temperature or humidity, poor nutrition management, hormonal imbalance, improper soil moisture etc, are the physiological causes and the fungal infections lead to pathological fruit drop. Incidence of insect pest attack is another cause. The first thing to be kept in mind is that flowering in most of the trees is profuse but the tree retains the load only that it can support. The rest is dropped. It starts with the flowering and continues till the time of harvest. In the early stages, as the size of the fruit is very small it escapes the notice of gardeners. In case of kinnow etc, there is tremendous drop during this period and most medium-sized fruit covers the area under the tree. It is too much to ignore and I receive most of the queries about fruit drop during this period. The fruit that drops has two types of symptoms. Either it is completely green or it has yellowing at the stem end and rest of the fruit may be green. In some of the cases, the end other than the stalk end is also yellow and soft. When completely firm and green fruit drops, it is due to hormonal imbalance. This fault can be corrected by spraying 2,4-D (sodium salt of horticulture grade). But as the chemical needed is to be used to correct hormonal imbalance, it is needed in very less quantity, about 10 milligram in one litre of water. It is difficult for a home gardener to measure such a minute quantity. Moreover, buying a pack of one kg of the chemical is also a costly affair. This can only be done if some gardening societies start making small packs and give them to gardeners. A word of caution for the gardeners is that the drift of the spray should not fall on any other fruit, plant, shrub or climber. It may get damaged. The pathological fruit drop, which is more pronounced, can be controlled by spraying aureofungin, dissolved at one gram in 14 litre of water or bavistin, dissolved at one gram to a litre of water. The spraying has to be started from the fourth month of the fruit set i.e. from beginning of July, at 15 days’ interval and four sprays are to be given for effective control. 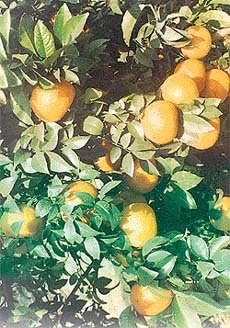 The premature flower and fruit drop in lemon is due to irregular watering. Any stress or excess watering may lead to it. Keep the watering frequency at twice a week and give only light water, to the extent of wetting the soil surface. Also add a good amount of farmyard manure. Besides adding nutrition, it will conserve the soil moisture.